This guy's ability is pretty game-breaking. Most of the time, you or your opponent win by using Monsters to attack. What happens if you can't summon any Monsters though? The main Weakness to this card is definitely Trap/Magic and Flip Effects. Now, we can counter Flip Effects by playing Light of Intervention or Royal Command. We can counter Magic Cards by keeping an Imperial Order out. As for Traps, the one you would worry the most is definitely Mirror Force. Just keep a couple of Seven Tools handy. Introduction: "Weee no more monsters." Flip Summon or Special Summon) any monster. Anaylsis: One of the anticipated card I was waiting for when LON comes out. over really quickly, if you protect this monster from traps and magics. Attach a Mage Power on it, it can totally murder someone in a few turns. some what useable, and does not bring towards the downfall of this card. kinds of bring towards the downfall of this card. Concludsion: Long name, nice effect. 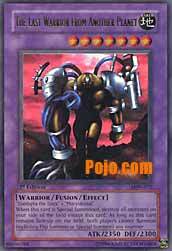 This fusion monster destroys all your monsters on the field when it is special summoned. Then, no one is allowed to summon any monsters. Order out for a few turns, all you have to worry about are traps. The fusing part shouldn't be too hard to pull out since a common poly was released in the Joey deck and the common fusion gate can also be used. I give this a 3/5. I think that it requires too many support cards to be effective which is why I didn't rate it too high. God bless all those men and women fighting in Iraq, risking their lives to save the Iraqi people and the rest of the world from a deranged madman. OK, now onto today's review. This is one of those cards that can create a lock. If you clear the field, then use this guy, your opponent will either have to destroy him with some other kind of effect, or rely on a flip effect monster. To create a TRUE lock, combine this guy with Light of Intervention. Since Light of Intervention forces all monsters to be summoned instead of set, your opponent will be POWERLESS to stop you unless they pull some kind of monster removal. If you get a clear monster field, then your opponent plays this guy and a Light of Intervention, I suggest you pray to get some kind of monster removal, because at 2350 a turn, you won't last very long. This guy actually has playable fusion parts. Zombyra the Dark is one of the more useful commons in the game, being able to get off a couple of strong attacks, and Maryokutai can sometimes be useful. However, I'd just play Zombyra and use a Goddess of the Third Eye or something. This guy's main weakness is flip effect monsters. Monster removal Magic and Traps can be dealt with using cards like Imperial Order and Seven Tools of the Bandit. Flip effect monsters, however, can end your plan really quickly. The biggest threats are Man-Eater Bug, Penguin Soldier (my personal favorite), Magician of Faith (recurse a Raigeki or something), and Cyber Jar. That's why I suggest Light of Intervention, because it can create one of the truest locks in the game. You can actually circumnavigate your own lock if you use Dimensionhole to remove LWFAP from the field, then summon a monster. The only flaw with this is that your opponent will get a summon as well, as LWFAP returns during your next Standby. But hey, it's an idea, isn't it? OK, I've rambled on long enough. Just be careful, as decks are built around this guy, and they can be NASTY if used correctly. Being a Fusion is less of a problem now with Fusion Gate, and Zombyra the Dark makes a decent attacker if the Fusion falls through.